Scientists excavating the interior of the Confederate submarine H.L. Hunley have found two buttons  the first personal effects from the crew of the hand-cranked vessel. "The buttons bring goosebumps to us," said state Sen. Glenn McConnell, chairman of the South Carolina Hunley Commission. Scientists are excavating the crew compartment, hoping to find the remains of the nine crewmen at the bottom of the silt-filled sub. The buttons, which were located Thursday but not yet removed and examined, were a sign the scientists could be getting closer. Also found was the edge of a wooden plank that could have been a seat or a shelf. The plank was too large to recover Thursday. "To find this organic substance in such a high state of preservation increases the reasons to hope the other artifacts and human remains are also well preserved," McConnell said. The Hunley sank Feb. 17, 1864, after sinking the Union ship Housatonic. The sub was raised from the Atlantic off nearby Sullivans Island last summer and brought to a conservation lab at the old Charleston Navy Base. Archeologists said they are concerned about the accelerated corrosion of the submarine in the air while the excavation continues. 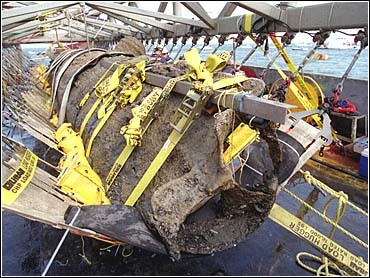 The Hunley is constantly sprayed with water during the work or submerged when scientists are not working on it. Conservators are also coating exposed frames with protective chemicals and wrapping them in plastic sheeting to reduce contact with the air.